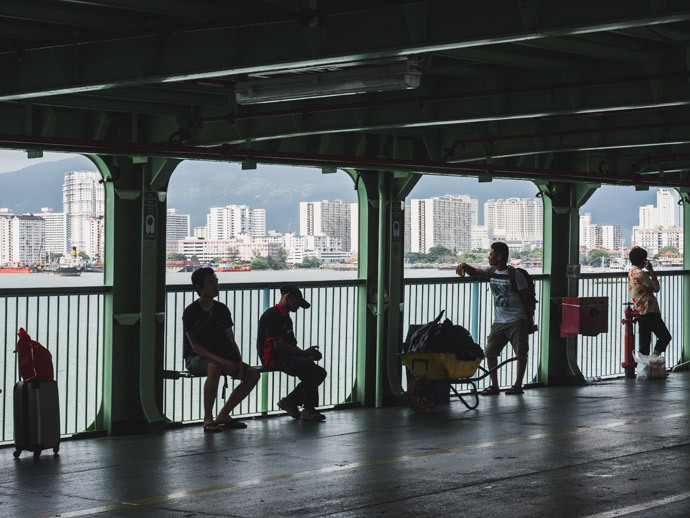 The Penang to Butterworth ferry was actually a really lovely experience. It’s a car ferry as well. So you arrive at the ferry port and when you see little stores and shops, continue walking along here and follow the signs to the ferry. You will eventually walk up ramps to a waiting area. At the time we did this, there was nowhere to buy tickets and I had read that you only pay for the ferry in one direction, so I assume you pay to come from Butterworth to Penang. Once the ferry arrives, cars are driven onto the ferry and there are some small bench seats along the sides for people to sit. 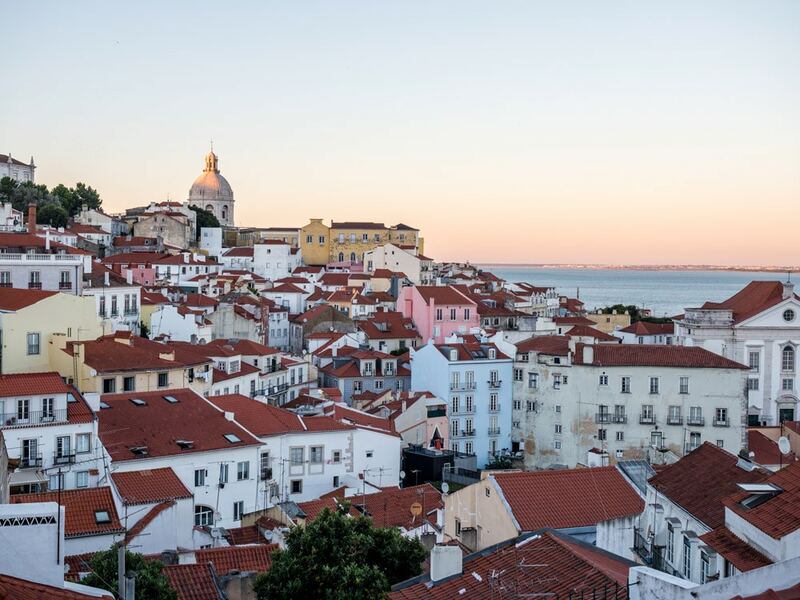 Otherwise, there is plenty of standing room along the railings looking out to the ocean. The ferry only takes 15 minutes, and it was really nice being on the water and looking back to Penang. Before you know it, you’re in Butterworth. Simply follow the signs to the train station and wait for your train. The Ferry terminal and train station are right next to each other, so it only takes about 5 minutes to get to the train station. Of course, I would aim to get to the train station at least 30 minutes before the train arrives. 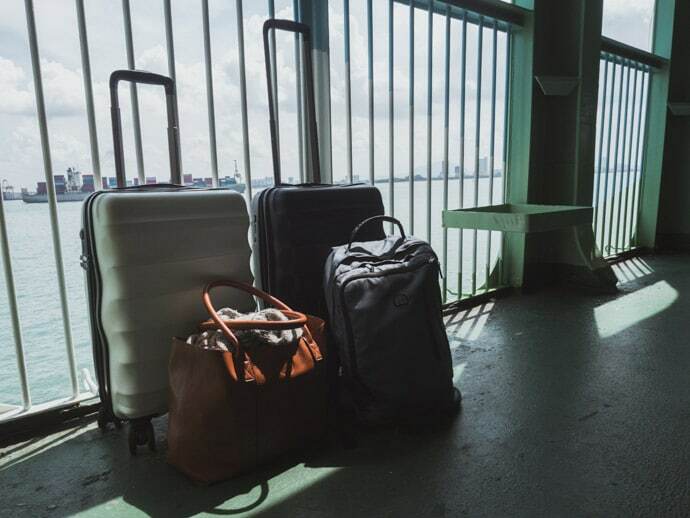 One thing to note is that there’s a flight of stairs to get over to the train station, so keep in mind you may need to carry your luggage upstairs. Tickets: This was actually free. I believe you only pay one way and it happens to be in the opposite direction. Unless this was a mistake of ours, the tickets are meant to cost RM 1.20. 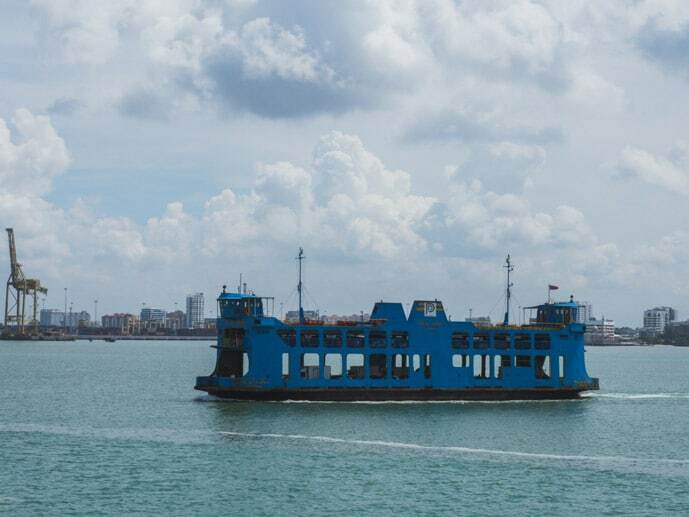 See more information about the Penang Ferry and timetable here. 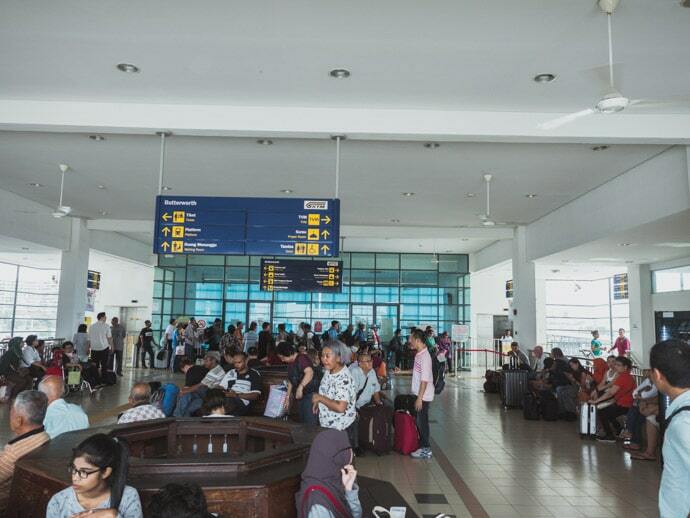 Once you arrive at Butterworth train station, as you have already purchased your ticket online (you could also buy your ticket when you arrive, but to ensure you get a seat, I would recommend buying online in advance), all you need to do is wait for your train. You can sit upstairs in the waiting area, and when the train arrives, they will make an announcement and you can make your way to the platform and train. The train is a modern high-speed ETS train, otherwise known as Electric Train Service. On board, you will receive a cute little brown paper bag with snacks in it, just like a packed lunch from home. Inside we got two packets of different biscuits, both of which were quite tasty. We also got a soy drink, which I wasn’t a fan of but Chris liked. Nothing over the top but a nice thought. There is also a snack bar with a small selection of food and drinks. There is also a power outlet in between the seats. 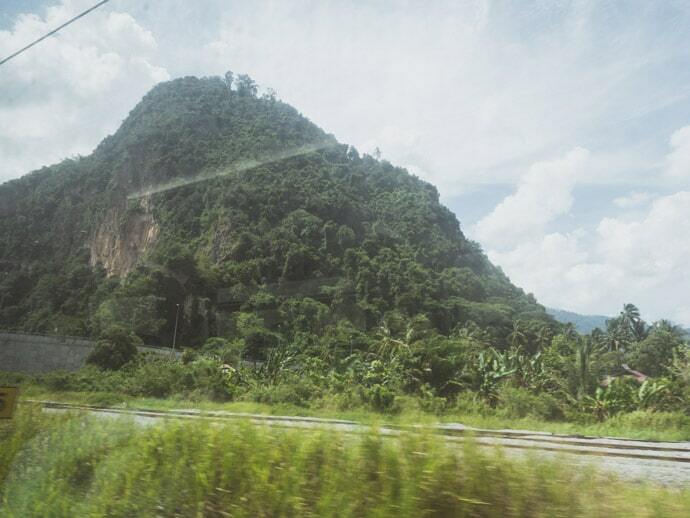 Our train took 4 hours to reach KL Sentral, via some nice yet repetitive scenery. It’s just nice to see more of Malaysia. Tickets: 79 RM each or around $25 AUD each (book ETS train online at easybook.com and you can also check the ETS Butterworth to KL Sentral schedule here). 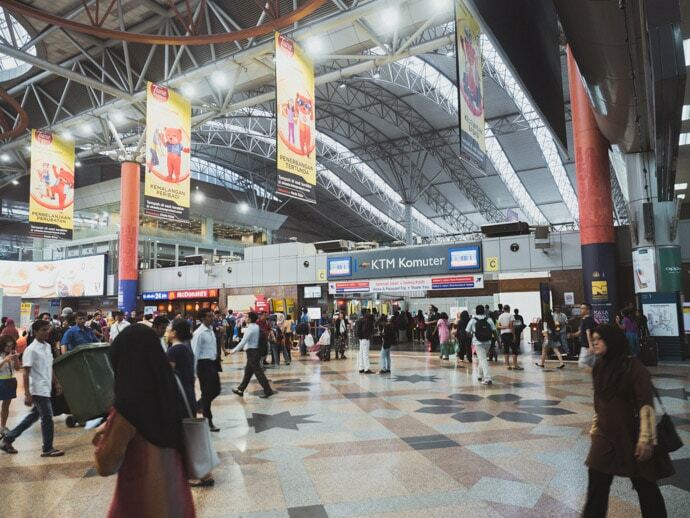 At KL Sentral you can get to many other areas of Kuala Lumpur, depending on where your hotel or Airbnb is. We were staying in the KLCC area, so we got the Light Rail or LRT to Dang Wangi station, which was only two stops away. Other options include the monorail, taxi’s and Uber, although we have heard Uber is a better choice than taxi’s in Kuala Lumpur. Would We Recommend The Train From Penang To KL? 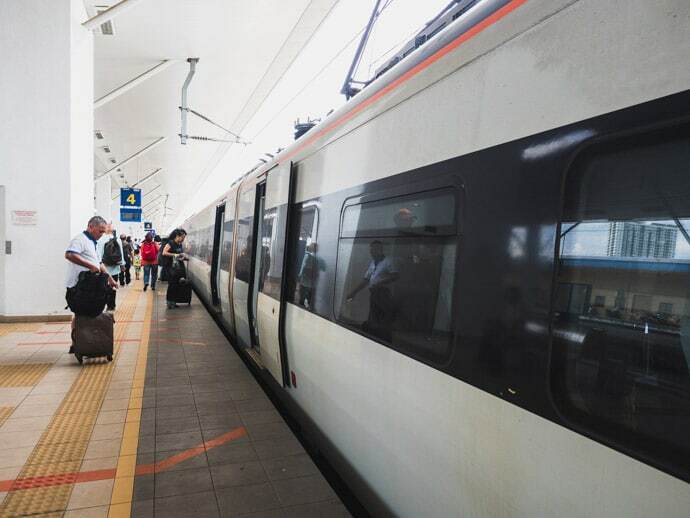 Getting the train from Penang to Kuala Lumpur was so simple, I would definitely recommend it. 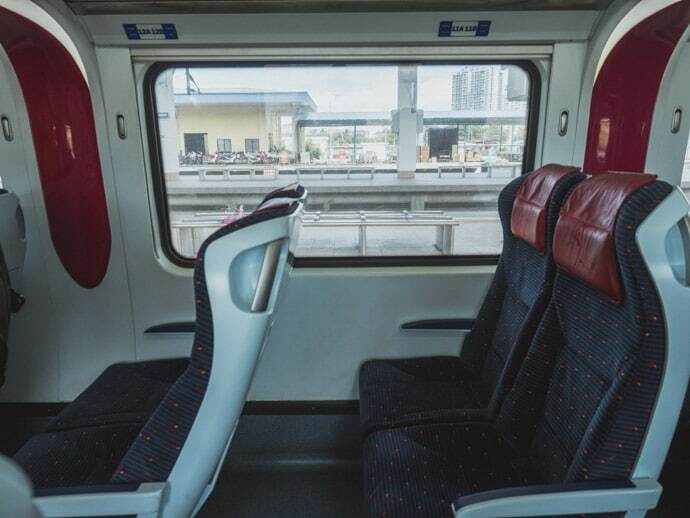 You get to see more of the countryside of Malaysia and relax on the train. Both the train and ferry were enjoyable. I thought we may have been able to see some of Butterworth but the train station is quite isolated there, so don’t count on that. The thing I loved about getting the train the most, was how simple the process was. Buying the ticket online was simple. Getting on the ferry and the frequency of the ferries made the ferry simple. The train station was right next to the ferry, and everything was well signed and easy. If I had to do it again, I would definitely choose the train over flying, however, you, of course, need to make sure you have the time to do this. Get your free printable Penang to Kuala Lumpur map here.